Self-Adhesive Guaranteed Silicone Breast Treatment. Includes Washable and Reusable Self-Adhesive Silicone Breast pieces and Hyper Heal Scar Cream. Effective for 6 Months of Treatment, Initial Improvement In 1 To 2 Weeks, Average Healing Time Is 1 To 3 Months. "Thank you for helping make a very traumatic experience less stressful! Due to extensive breast augmentation surgery I had a jagged, uneven, discolored raw scars. 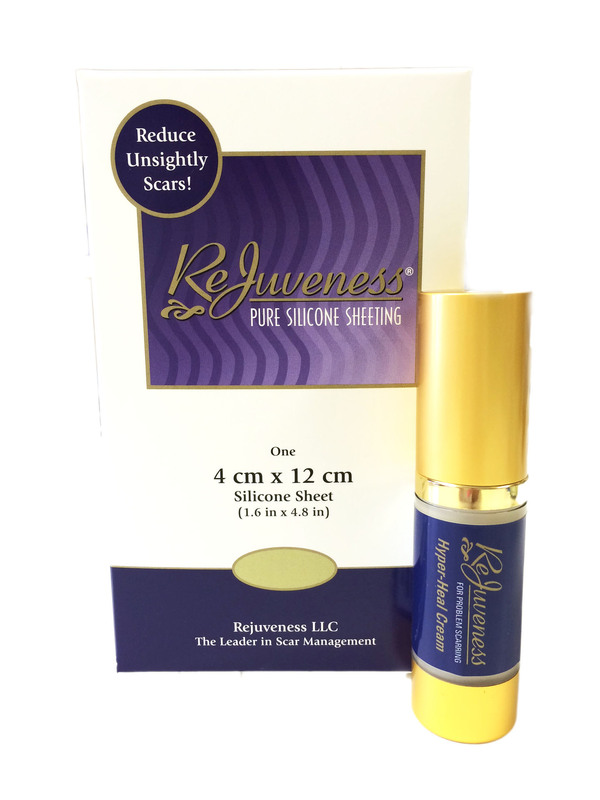 After using ReJuveness products for a short period I noticed that my scar was smoothing down and blending with my normal skin pigmentation. Thank you for helping make a very traumatic experience a lot less stressful. Lisa F."
"I tried it after my breast reduction surgery and I could feel it working right away! I saw the ad and decided to try it and I was truly amazed - I could literally feel it was working ... I don't understand the molecular stuff going on. but... I did have a burning. stretchy, almost tearing feeling and that was gone as soon as I put the piece on. Right away. it felt softer - there is definitely a physical reaction of some kind. It feels like a softening reaction between whatever is in the breast piece and the skin. It's changed the shape of the scar. It's softened it, and it's changed its color." "My doctor works with burn victims a lot and he told me to use ReJuveness because he knew it would work. He was familiar with the concept and said I should absolutely try it. Now, after just three months I�d say it's about 40% improved. The nice thing is that it doesn't deteriorate or saturate - you can just pick it up and reuse it. Once this scar is healed I can apply the ReJuveness strip to my other breast and heal that one as well! It doesn't leak or melt or anything. It's not harmful - there is no silicone getting inside you or anything. And the fact that you just keep using it - whoever thought of that was a genius!" "If it weren't for ReJuveness I would've tried vitamin E or some other cream or I would've just lived with it. For me, there's no reason not to try ReJuveness. Regards Jill M, Stewart, CA "
For breast scars up to 40 years old when their condition involves discoloration, keloid, Hyper-pigmentation, lumpiness, itching, soreness or indentation.